We begin a developing of new AltMove 3 version. We plan to make two(or more) versions of AltMove3. Atleast one will be free as AltMove version 2. This version will contains almost all actions 2nd contains. Moreover, it is built on modified engine of AloneKey and will allow to combine more key/mouse combinations, as you can see at the picture below. Also, atleast one will be paid. But when it is alpha version, it will be free, everyone can try it. Time after time, we will upload new top versions, and when all will be fine, we'll divide them. More key/mouse combination, you can use mouse buttons as key modifiers. Also, you can do not use mouse buttons in combination at all :) Just moving. Drag'n'Do icons can be sized and moved in different places in setup window. New program interface, but you can use old one. Some parts of Actions became child actions, for example, Homing Mode of Resize Action. O'K! Now you can download and try AltMove3 Alpha. Warning! Do not use AltMove3 with AltMove2 together! - * "Map" feature for click area. - Magnifier for windows 7. Through form after the picture. - Engine problem with dispatching mouse event between drag'n'do and simple actions. -Screenshot action has been changed. 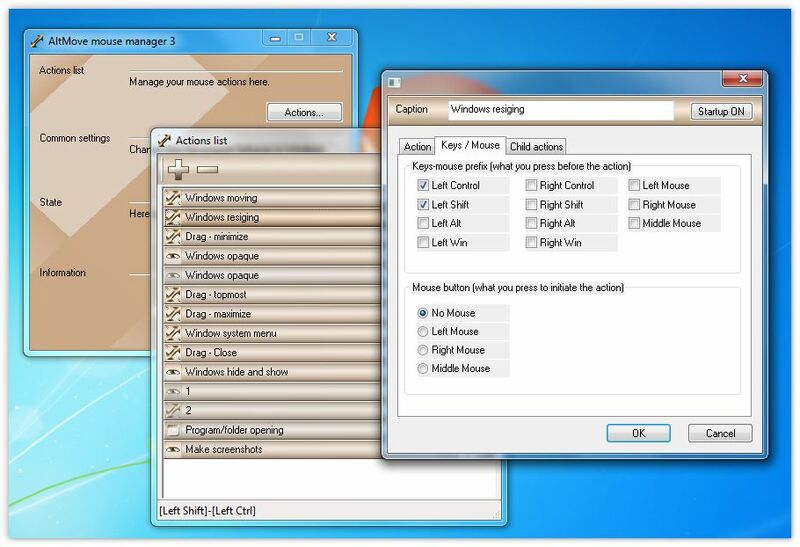 -Drag'n'Do settings window has been changed. © 2015-2018 DeskEx. All Rights Reserved.